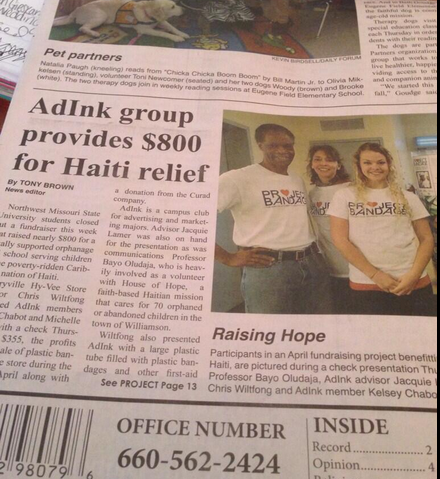 During the Spring 2014 term, AdInkers pulled off a major fundraiser called Project Bandage. The focus is to collect bandages for children at the House of Hope orphanage in Williamson, Haiti. This orphanage was started by Northwest professors Bayo Oludaja and Michael Bellamy, who visit the orphanage at least twice a year, always bringing supplies for the kids and the townspeople. The children have begun playing soccer on a new soccer field, but since grass is scarce in Haiti, the field is simply dirt, and some pebbles and rocks, too. This is one reason the children need bandages… thus, Project Bandage! May 2, 2014 — Front page of the Maryville Daily Forum! Maryville’s Hy-Vee stepped up as a major sponsor for this project, opening its doors to Project Bandage volunteers on several occasions, including an end-of-the-semester BBQ where $1 from each dinner sold went to the cause. During the BBQ, volunteers worked a prize table where guests could spin an awesome prize wheel to win prizes donated by local businesses. Hy-Vee also donated the proceeds from all bandage sales during the month of April to the cause! We can’t thank Hy-Vee enough for their generosity! On campus, students had a chance to win prizes, too, by throwing a soccer ball at a giant bandage! Participants paid $1 to play, and many walked away with great prizes. And, Carlton Wilcoxson managed to block a few goals, even while wearing the giant bandage! Kelsey Chabot worked the crowd on the microphone, enticing passers-by to play! Ini the Spring term, we raised $805, gathered 173 boxes of bandaids, 2 boxes of gauze, and 3 bottles of hydrogen peroxide, AND made the front page of the Maryville Daily Forum! See coverage in the Northwest Missourian, April 16, 2015.